Have you heard about our Adult Winter Reading Club this year? If you read two “Up Lit” books between January 15 and March 15, we’ll enter you into a drawing to win a $50 gift card! What is “Up Lit,” you ask? Kind of what it sounds like – uplifting books that tell stories of compassion and kindness. In other words: happy stories that can pull us out of the winter doldrums. For some suggested reading and more information, go to https://www.cooklib.org/winter-reading-club/ or stop by the reference desk at Cook Park or Aspen Drive. 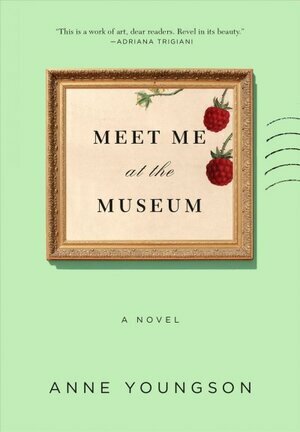 If you’re looking for a book to read in this challenge, try Meet Me at the Museum by Anne Youngson. Ms. Youngson has published this, her first novel, at the tender age of 70. And it shows – this is a quiet, meditative, wise little book. Written in epistolary format, it shares the musings of two older adults who end up writing letters to each other entirely by accident. Tina Hopgood, in England, is the wife of a farmer, a mother and a grandmother; her correspondent, Kristian Larsen, is a curator at a natural history museum in Denmark. Their correspondence starts out with an inquiry about the Tollund Man, a perfectly preserved corpse from about 250 BC, but ends up becoming an intimate relationship developed through the written word. This book is not a page-turner; it doesn’t have much of a plot at all, really. What it does offer is insightful observations on life, aging, and whether it’s possible to start over once you’re older. The letters are introspective and carefully written, offering a window into the characters’ interior lives that is both relatable and thought-provoking. If you’re looking for a gentle, hopeful read, give this book a try.